The half-used tomato, still perfectly serviceable, sat alongside a cucumber of similar status in the “rot drawer” of the fridge. In summer, I tend to overbuy at the farmers’ markets just because everything looks so good (here are some of my favorite recipes for summer farmers’ market produce like corn and zucchini). If you’re like me, you’ll often find remnant veggies on hand—I hate to throw stuff out, so I try to find creative uses. Hence: Garbage gazpacho. There are a bazillion recipes for gazpacho on the internet. Feel free to try one of those; this is not one of them. 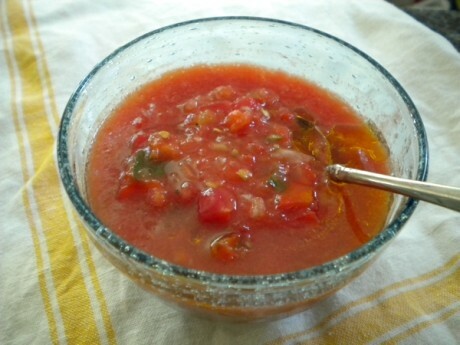 This recipe is simply a matter of necessity, and it demonstrates how easy it is to make your own version of gazpacho. Dump all the vegetables into a blender and pulse on ‘puree’ until the texture is to your satisfaction. Drizzle 1 Tbsp. olive oil and lemon juice, and season with salt and pepper; puree briefly to combine.